You will hear us mention toys over and over again as a way to keep dogs occupied and entertained, especially toys of the chewing type variety that can be stuffed, such as Kong’s and Busy Buddies – now why not keep these in a toy box? I don’t know about you, but we seem to have toys that disappear under furniture, are ‘somewhere’ around and with some dogs seem to end up buried outside. Since bringing in a Toy Box a couple of years ago, the amount of toys lost has definitely reduced. An additional bonus with the Toy Box is that dogs seem to love it and will rummage around in it looking for a toy to play with or chew on - definitely provides entertainment. If your dog is Clicker Savvy then very easy to get the dog to put its toys back in the box at the end of the day – other option is we have a quick tidy up and do it for them either daily or every few days. A Doggy Toy Box does not need to be anything fancy and over the years we have had one which was made of cane for the lounge, another of wood and an outside one of plastic. 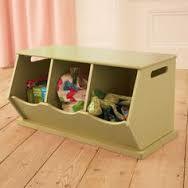 It needs to be sturdy and of a height that the dog can easily get toys in and out and kept in a central location that is easily accessible. 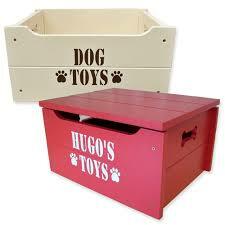 As our dogs are mostly inside we keep our Toy Box in the lounge for easy access. 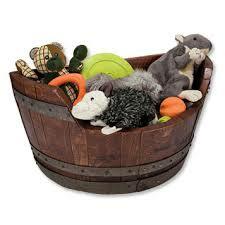 There are a few samples of Toy Box’s above and if you Google for them you will find the most amazing variety.